“Asia Noviter Delineata.” Carte-a-figures by Willem Blaeu depicting the native manners of dress, and nine city plans and views at the top. Copper engraving printed in 1640, coloured by a later hand. Size 41 x 55,2 cm. A fine example of Willem Blaeu’s famous map of Asia. Like the Blaeu Africa map, this is a map that appeals both to a sense of cartographic history and to an aesthetic sense of beauty. This is a cornerstone, folio-size map of Asia and is one of the better known, more decorative maps of Asia of the 17th century. This map is basically a reduction of Blaeu’s wallmap of Asia of 1608. 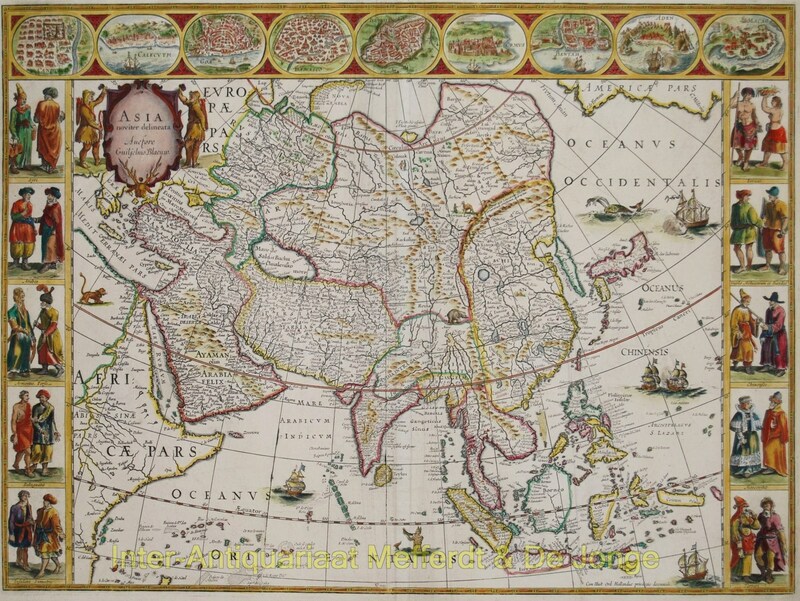 The map contains extensive details on what was known of Asia in the early 17th century. Korea is still an enlonged island. Japan has a predominantly east to west direction. In China, the Great Wall is shown along with the in-land lakes. Willem Janszoon, or Willem Jansz Blaeu (1571-1638) as he is more commonly known, was one of the most noted Dutch cartographers and map publisher of the 17th century. Blaeu’s maps are “esteemed by collectors for their decorative quality, historical importance, and as the highest expression of Dutch cartographic art during the period of its supremacy” (Tooley, p 28). After preparation as a pupil of the great Danish astronomer,Tycho Brahe, Blaeu initially concentrated on globe making and separately published maps, including wall maps of the continents. From 1608, he dominated the market for sea atlases and in 1630 produced his terrestrial atlas. These atlases were continued by his sons, culminating in the great Atlas Maior of 1662 in 11 volumes with subsequent editions. The map is in its 3rd state. The 1st state of 1617 was issued separately and has the name of “Willem Jansz” (not Blaeu) in the title cartouche. This state is rare and is virtually impossible to acquire. The 2nd state of 1621-30 has the name changed to “Guiljelmo Blaeuw” in the title.